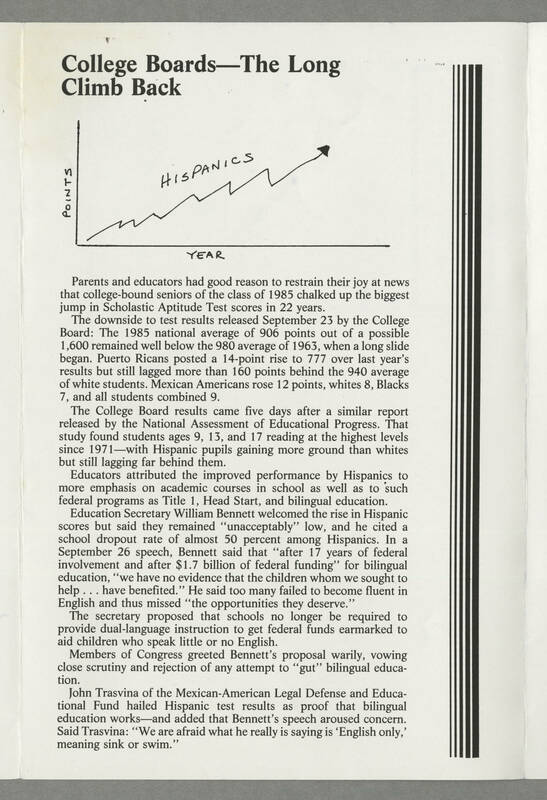 College Boards--The Long Climb Back [[Graph text]]POINTS HISPANICS YEAR[[end graph text]] Parents and educators had good reason to restrain their joy at news that college-bound seniors of the class of 1985 chalked up the biggest jump in Scholastic Aptitude Test scores in 22 years. The downside to test results released September 23 by the College Board: The 1985 national average of 906 points out of a possible 1,600 remained well below the 980 average of 1963, when a long slide began. Puerto Ricans posted a 14-point rise to 777 over last year's results but still lagged more than 160 points behind the 940 average of white students. Mexican Americans rose 12 points, whites 8, Blacks 7, and all students combined 9. The College Board results came five days after a similar report released by the National Assessment of Educational Progress. That study found students ages 9, 13, and 17 reading at the highest levels since 1971--with Hispanic pupils gaining more ground than whites but still lagging far behind them. Educators attributed the improved performance by Hispanics to more emphasis on academic courses in school as well as to such federal programs as Title 1, Head Start, and bilingual education. Education Secretary William Bennett welcomed the rise in Hispanic scores but said they remained "unacceptably" low, and he cited a school dropout rate of almost 50 percent among Hispanics. In a September 26 speech, Bennett said that "after 17 years of federal involvement and after $1.7 billion of federal funding" for bilingual education, "we have no evidence that the children whom we sought to help...have benefited." He said too many failed to become fluent in English and thus missed "the opportunities they deserve." The secretary proposed that schools no longer be required to provide dual-language instruction to get federal funds earmarked to aid children who speak little or no English. Members of Congress greeted Bennett's proposal warily, vowing close scrutiny and rejection of any attempt to "gut" bilingual education. John Trasvina of the Mexican-American Legal Defense and Educational Fund hailed Hispanic test results a proof that bilingual education works--and added that Bennett's speech aroused concern. Said Trasvina: "We are afraid what he really is saying is 'English only,' meaning sink or swim."